Luis Enrique missed the win over Malta due to a family emergency. 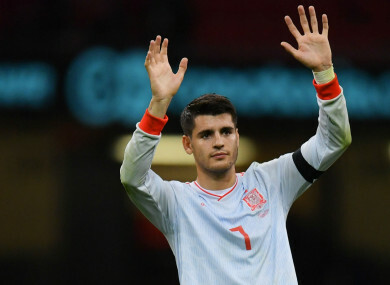 AN ALVARO MORATA brace proved decisive as Spain laboured to a 2-0 win away to Malta in the absence of coach Luis Enrique, making it two wins in as many games in Euro 2020 qualifying. It was announced earlier on Tuesday that Luis Enrique would not be at the game due to a family emergency, though there never looked to be any danger of an upset under the guidance of assistant Robert Moreno. Although it took them longer to make the breakthrough than they would have wished, Morata put Spain ahead in the 31st minute, with Malta having just 16 per cent of the ball in the first half. The visitors continued to underwhelm despite their dominance in the second half, though Morata doubled his tally towards the end to wrap up a comfortable – albeit unimpressive – victory. Spain unsurprisingly dominated proceedings and Saul Niguez looked their most likely route to goal. The midfielder shot agonisingly wide from distance in the 16th minute, shortly before slicing a more presentable opportunity over from 12 yards out. Morata made no such error just past the half-hour mark, however, racing on to Mario Hermoso’s pass and beating Henry Bonello – who got a hand to the ball – from a tight angle. Spain stepped things up again around the hour, going close three times in as many minutes, Morata sending a header just wide before Marco Asensio forced Bonello into two smart saves. But Bonello was helpless 17 minutes from time, as Morata rose to meet the cross of Jesus Navas – introduced for Saul a few moments earlier – and finish Malta off. Email “Spain labour to victory in the absence of manager”. Feedback on “Spain labour to victory in the absence of manager”.